Yesterday probably didn’t turn out as well as Cardinal Health had expected. The good news: The company announced the acquisition of Medtronic's Patient Care, Deep Vein Thrombosis and Nutritional Insufficiency businesses for $6.1 billion in cash. The bad news: Cardinal sharply lowered its outlook for future profits from its pharmaceutical distribution business. The company cited lower generic drugs prices and “sell-side" pressure from pharmacy customers as two primary causes of its financial woes. Wall Street was unhappy: Cardinal stock closed down a whopping 11%. McKesson and AmerisourceBergen stocks fell in sympathy. Independent pharmacies have been backed into a corner—and have responded by pushing back against their wholesale suppliers. Cardinal’s warning highlights the coevolution of profits within the pharmacy channel ecosystem. Expect wholesalers to be increasingly desperate to make up these lost funds. A reminder: The unexpected generic drug inflation of 2013-2014 was generally good for pharmaceutical wholesalers. As I describe in Section 4.6.3. of our 2016–17 Economic Report on Pharmaceutical Wholesalers and Specialty Distributors, wholesalers benefited from generic price increases, which were typically passed on to their pharmacy customers. Generic inflation began easing in 2015. This was due partly to the FDA’s having cleared much of the backlog for new generic drug applications. However, I believe that the decline was due also to the new generic purchasing consortia formed by wholesalers and large pharmacies. These groups have reduced wholesalers’ generic acquisition costs, which has increased wholesalers’ share of generic channel volume. Wholesalers’ large customers had historically purchased generics directly from manufacturers rather than through the wholesale channel. 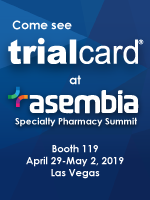 However, the reduced acquisition costs from retail-wholesale purchasing consortia encouraged large pharmacies to shift generic purchasing to wholesalers. Notable examples of such arrangements include Publix (AmerisourceBergen), Albertsons (McKesson), and OptumRx (Cardinal Health). A drug wholesaler’s gross profit from distributing brand-name drugs can come from manufacturers (buy-side) and from customers (sell-side). The buy-side and sell-side terminology derives from a wholesaler’s buying products from a manufacturer and then selling products to a wholesaler’s pharmacy customers. In theory, the highly consolidated drug wholesaling market should limit sell-side pricing pressure. However, drug wholesaling is highly competitive. Downstream consolidation continues to pressure wholesaler margins. And every so often, one of the drug wholesalers inevitably triggers a price war, which moves little market share but reduces the industry’s total profits. Today, the battle is raging over smaller, pharmacist-owned independent pharmacies, which are more profitable for wholesalers than are large chains and mail pharmacies. Pharmacy owners have responded to their own profit pressures partly by collaborating with peers via Group Purchasing Organizations (GPOs). 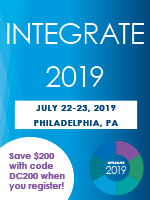 These pharmacy buying groups have altered and accelerated wholesaler competition for the business of independent pharmacies—and have forced wholesalers’ reduced generic costs to be passed down the channel. GPOs leverage the purchasing power of smaller pharmacies to get discounts and rebates from preferred suppliers of drugs and other products. 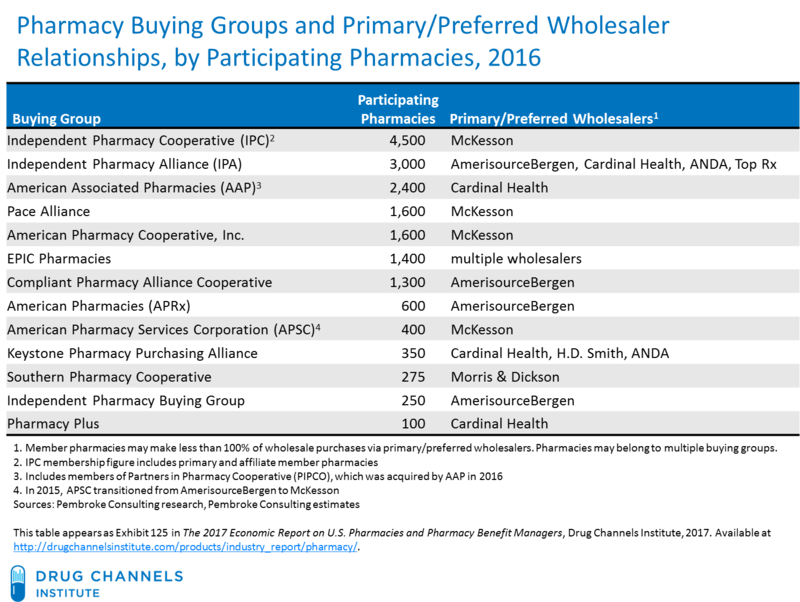 The pharmacies in a buying group agree to focus their purchases with the group’s preferred wholesaler. In turn, the wholesaler agrees to provide a discount or rebate on consolidated purchases made by the buying group’s members. 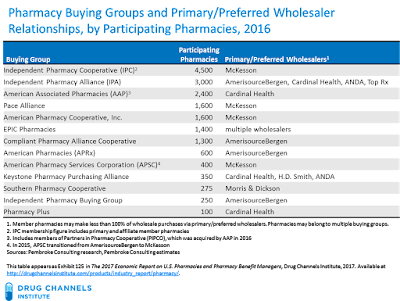 The chart below, from our 2017 Economic Report on U.S. Pharmacies and Pharmacy Benefit Managers, highlights the largest pharmacy buying groups and the primary or preferred wholesaler relationship. Consequently, smaller pharmacies can purchase brand-name drugs at costs that are only slightly higher than those of the largest pharmacies. In exchange for these favorable discounts on brand-name drugs, a pharmacy must simultaneously agree to a minimum purchase volume of generic drugs (total volume or a percentage of generic spend). As the GPOs have grown, wholesalers have had to compete more aggressively to win and retain the business of the groups and their members. When a buying group switches its primary wholesaler, the non-selected wholesalers will work hard to retain as much business as possible. Some of these groups even compete to provide wholesale distribution services to their members. Pharmacy owners will seek the lowest acquisition costs by purchasing from a primary wholesaler via a buying group while opportunistically sourcing products from a buying group’s warehouse. Members also sometimes choose to make purchases outside the buying group relationship. In yesterday’s release, Cardinal stated that it expects generic deflation “to be in the low-double digits” for its 2017 fiscal year (ending June 30, 2017) and “to moderate to mid-single digits in fiscal 2018” (ending June 30, 2018). That suggests that it will take at least 12 months for the generic market to stabilize. The drug wholesaling business faces many structural headwinds, as I outline in Five Industry Trends for U.S. Drug Wholesalers in 2017. Expect more turbulence as the pharmacy market’s economics continue to coevolve.